If you’re like me, every time you travel you’ll find yourself wishing you had your quadcopter with you to rip through some unexplored landscapes and really get a good view of the new places you’re bound to see. Luckily, traveling with your drone is actually quite easy if you know the rules. In this guide, I’ll walk you through what you need to know as well as some suggestions I like to follow. Note: This guide is specifically written for travel within the United States. 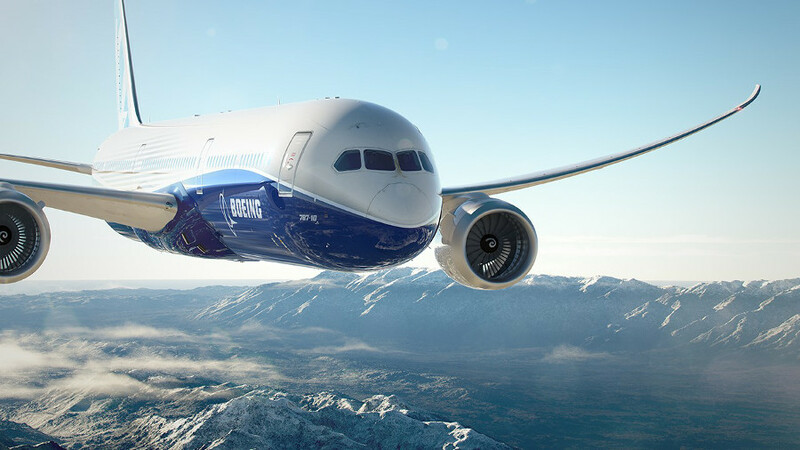 FAA regulations closely follow those put forth by the Internation Air Transportation Association (IATA) and thus much of this advice is useful to travelers worldwide. 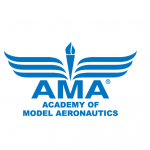 Still – readers outside the USA should consult their own civil aviation authority for rules and regulations regarding radio equipment and Lithium batteries before traveling. 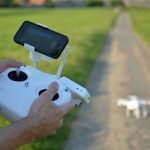 When it comes to drones and drone equipment, there are only a few hard and fast rules that you must follow. You must bring LiPo batteries in your carry-on luggage. I prefer to pack them in ZipLoc bags like toiletries. All removeable Lithium batteries must be stored in your carry-on luggage. This includes Goggle and Transmitter batteries. You cannot carry on batteries of power capacity greater than 100W h without specific permission from the airline you are traveling with. Batteries must have markings or stickers clearly indicating their capacities. Battery leads must not have exposed metal. 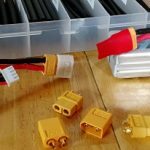 Check out the XT-60 lead covers here. As long as it is not powered on, there are no specific regulations that say you cannot carry quadcopters in your carry-on luggage. However, there are rules that specify that hard & sharp objects greater than 7 inches in length cannot be stowed in carry-on luggage. The same goes for tools 7 inches or longer. There are also several items you might have in your toolbag which will not be allowed as well. For instance, scissors and hobby knifes are not allowed in carry-on baggage. A full list of prohibited items can be found on the TSA website. This might be obvious but it bears mentioning: you cannot legally power on equipment that emits RF energy while onboard an aircraft. 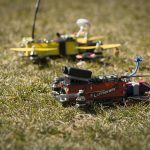 This means your radio control transmitter or your quadcopter with a built in FPV system. Recent regulations have allowed the use of consumer electronic devices onboard aircraft but drones do not qualify as consumer electronic devices. Keep all your equipment powered off! This is the most important thing to remember when traveling with expensive equipment. When it comes down to the wire and you are in that security line – it is up to the TSA agent on duty to either let you through or tell you to throw something he doesn’t like away. Even if you bring a document printed from the FAA website explicitly granting you permission to bring said item onboard – it is the TSA officer’s right to turn you away. Not all TSA officers take their job seriously and many do not know the regulations they are supposed to enforce. You need to be prepared for this by knowing the rules and knowing how to be polite in the face of incompetence. You should also be prepared for the “worst case scenario”. Pelican cases are my favorite hard case option for packing drones for travel. I pack my drone(s), radio transmitter, FPV goggles, tools and spare parts in checked luggage. As a miniquad pilot, I generally pack everything in my backpack just like normal and wrap the drone (which is normally strapped to the front of the backpack) in some clothes to protect it. I then place the backpack straight into a large checked-luggage bag. You should still have some room for several days worth of clothes and toiletries. I discharge my LiPo batteries to storage charge. This dissipates the majority of the energy stored in the batteries should the unthinkable occur. 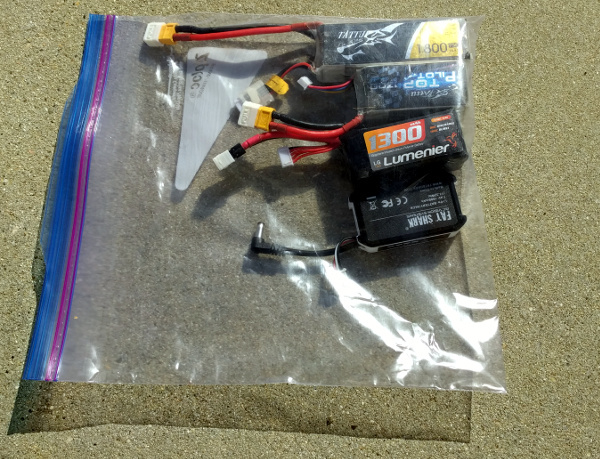 I pack all of my Lithium batteries into a ziploc bag just like I do my carry-on toiletries. When going through security, I remove this bag and put it in a bin to go through the scanner. Some people suggest using Lithium safe bags. These bags can and do fail – masking the problem in the process, so I can’t recommend them. I never bring all of my batteries on a flight. I generally only bring 3 or less batteries. The idea is if I get a TSA scrooge who will not let me through, I’m only out a few batteries, not my whole collection. Also, having less batteries makes the battery bag less intimidating to TSA agents. I bring a printed copy of the FAA’s guidelines for lithium batteries with me in my carry on baggage. When my carry-on battery bag is questioned by a TSA agent, I calmly and respectfully explain that they are Lithium batteries for use with electronics and that I am following guidelines I found on the FAA website. I offer them the printed guidelines if they are interested. While simply stuffing my equipment into my normal checked luggage bag works fine for racing drones, I realize that some viewers might have larger, more expensive aircraft they wish to bring aboard an airplane. For those readers toting an expensive photography drone to their local airport, I highly recommend investing in a hard-shelled case with foam padding. When shopping cases, there is one name brand I generally fall back to: Pelican cases. 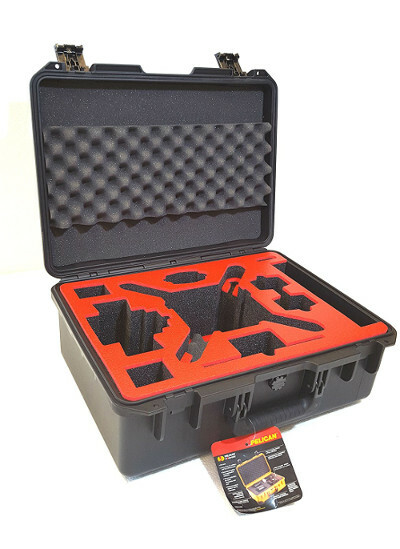 Pelican cases come in all sizes and feature removeable foam interiors that you can customize to fit whatever type of quadcopter you are looking to transport. They even have pre-moulded cases for some popular quadcopters, like this one for the DJI Phantom pro. They may seem expensive but they will last a lifetime. When I was building custom drones for a military contractor a few years ago, I always delivered the drones in Pelican cases and got rave reviews on their durability. If you are looking for something on the cheaper end of the spectrum, just shop around Amazon. There are a few cloner manufacturers who have copied much of the Pelican design at a significant cost savings such as this one. I’d recommend staying away from any of the “aluminum” cases that have silver edges. I’ve owned several of these and they are quite easy to break, even with just a minor drop.